Based on your emails, you guys are probably wondering where I have been for the past few weeks… I’ve been working in the Mavromatic labs finishing up a bunch of things. 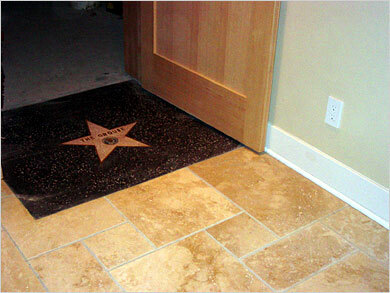 Remember the Walk of Fame star I posted about back in August? I finally got around to taking a couple photos of the finished product (but please excuse the dust). I still need to apply some floor wax over it and give it a good polish. At the very least, you can see what the finish product looks like. I’m really happy with the way it turned out. But to be honest it was one heck of an undertaking! Terrazzo is a beautiful thing with it’s all done… the drawback is the amount of work it takes to get it there. Grinding and polishing is VERY messy! I tried both the dry and wet grinding/polish methods… with the dry method you get black fine dust everywhere and with the wet method, get ready to clean all the black muddy paste off of everything up to twelve feet away. Don’t say I didn’t warn you! As for the two questions I always get asked, 1) the whole process took a few months and 2) it cost me a grand total of $326.05 (solid brass medalian, solid brass letters, brass outline, terrazzo chips, concrete coloring, 5000psi cement) less labor. 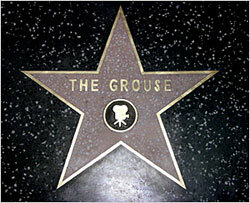 And for those of you wondering what the heck “The Grouse” is/means… it’s The GReek house. I’m Greek, it’s the house I built and it deserves it’s own star!